Image retrieved from livieputnamita.com on March 1st, 2014. Image retrieved from www.latinamericanstudies.org on March 1st, 2014. Image retrieved from upload.wikimiedia.org on March 1st, 2014. Image retrieved from peyote.org on March 1st, 2014. Ever since the arrival of the first Europeans in the New World, Peyote has provoked controversy, suppression, and persecution. Condemned by the Spanish conquerors for its “satanic trickery,” and attacked more recently by local governments and religious groups, the plant has nevertheless continued to play a major sacramental role among the Indians of Mexico, while its use has spread to the North American tribes in the last hundred years. The persistence and growth of the Peyote cult constitute a fascinating chapter in the history of the New World—and a challenge to the anthropologists and psychologists, botanists and pharmacologists who continue to study the plant and its constituents in connection with human affairs. How old is the Peyote cult? An early Spanish chronicler, Fray Bernardino de Sahagun, estimated on the basis of several historical events recorded in Indian chronology that Peyote was known to the Chichimeca and Toltec at least 1890 years before the arrival of the Europeans. This calculation would give the “divine plant” of Mexico an economic history extending over a period of some two millennia. Then Carl Lumholtz, the Danish ethnologist who did pioneer work among the Indians of Chihuahua, suggested that the Peyote cult is far older. He showed that a symbol employed in the Tarahumara Indian Peyote ceremony appeared in ancient ritualistic carvings preserved in Mesoamerican lava rocks. More recently, archeological discoveries in a dry caves and rock shelters in Texas have yielded specimens of Peyote. These specimens, found in a context suggesting ceremonial use indicate that its use is more that three thousand years old. The earliest European records concerning this sacred cactus are those of Sahagun, who lived from 1499 to 1590 and who dedicated most of his adult life to the Indians of Mexico. His precious, first-hand observations were not published until the nineteenth century. Consequently, credit for the earliest published account must go to Juan Cardenas, whose observations on the marvelous secrets of the Indies were published as early as 1591. It is not known whether or not the Chichimeca were the first Indians, living where Peyote abounded, were the first to discover its use and that it spread from them to the Cora, the Huichol, and other tribes. Since the plant grows in many scattered localities in Mexico, it seems probable that its intoxicating properties were independently discovered by a number of tribes. The ceremony among the Cora, Huichol, and Tarahumara Indians has probably changed little in content over the centuries: it still consists, in great part, of dancing. The modern Huichol Peyote ritual is the closest to the pre-Colonial Mexican ceremonies. Sahagun's description of the Teochichimeca tirutal could very well be description of the contemporary Huichol ceremony, for these Indians still assemble together in the desert 300 miles northeast of their homeland in the Sierra Madre mountains of western Mexico, still sing all night, all day, still weep exceedingly, and still so esteem Peyote above any other psychotropic plant that the sacred mushrooms, morning Glories, Datura, and other indigenous hallucinogens are consigned to the realm of sorcerers. Most of the early records in Mexico were left by missionaries who opposed the use of Peyote in religious practice. To them Peyote had no place in Christianity because of its pagan associations. Since the Spanish ecclesiastics were intolerant of any cult but their own, fierce persecution resulted. But the Indians were reluctant to give up their Peyote cults established on the centuries of tradition. 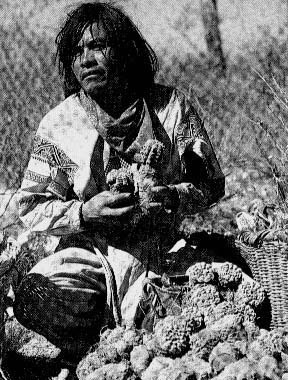 During the last decade of the nineteenth cenury, the explorer Carl Lumholtz observed the use of Peyote among the Indians of the Sierra Madre Occidental of Mexico, primarily the Huichola nd Tarahumara, and he reported on the Peyote ceremony and on various kinds of cacti employed with Lophophora williamsii or in its stead. The Peyote hunt is literally a hunt. Pilgrims carry tobacco gourds, a necessity for the journey's ritual. Water gourds are often taken to transport water back home from Wirikuta. Often the only food taken for the stay in Wirikuta is tortillas. The pilgrims, however, eat Peyote while in Wirikuta. They must travel great distances. Today, much of the trek is done y car, but formerly the Indians walked some to hundred miles. The preparation for gathering peyote involves ritual confession and purification. Public recitation f all sexual encounters must be made, but no show of shame, resentment, or jealousy, nor any expression of hostility, occurs. For each offense, the shaman makes a knot in a string which, at the end of the ritual, is burned. Following the confession, the group, preparing to set out for Wirikuta—an area located in San Lui Potosi—must be cleansed before journeying to paradise. Upon arriving within sight of the sacred mountains of Wirikuta, the pilgrims are ritually washed and pray for rain and fertility. Amid the praying and chanting of the shaman, the dangerous crossing into the Otherworld begins. This passage has two stages: first, the Gateway of the Clashing Clouds, and second, the opening of the clouds. These do not represent actual localities but exist only in the “geography of the mind”; to the participants the passing from one to the other is an event filled with emotion. Upon arrival at the place where the Peyote is to be hunted, the shaman begins ceremonial practices, telling stories from the ancient Peyote tradition and invoking protection for the events to come. Those on their first pilgrimage are blindfolded, and the participants are led by the shaman to the “cosmic threshold” which only he can see. All stop, light candles, and murmur prayers, while the shaman, imbued with supernatural force, chants. Finally, Peyote is found. The shaman has seen the deer tracks. He draws his arrow and shoots the cactus. The pilgrims make offerings to the first Hikuri. More Peyote is sought, basketfuls of the plant eventually being collected. On the following day, more Peyote is collected, some of which is to be shared with those who remain at home. The rest is to be sold to the Cora and Tarahumara Indians, who use Peyote but do not have a quest. The ceremony of distributing Tobacco is then carried out. Arrows are placed pointing to the four points of the compass; at midnight a fire is built. According to the Huichol, Tobacco belongs to fire. The shaman prays, placing the Tobacco before the fire, touching it with feathers, then distributing it to each pilgrim to puts it into his gourd, symbolizing the birth of Tobacco. Among the Tarahumara, the Peyote cult is less important. Many buy their supplies of the cactus, usually from huichol. Altho the two tribes live several hundred miles apart and are not closely related, they share the same name for Peyote—Hikuri--and the two cults have many points of resemblance. The Tarahumara peyote dance may be held at any time during the year for health, tribal prosperity, or for simple worship. It is sometimes incorporated into other established festivals. The principal part of the ceremony consists of dances and prayers followed by a day of feasting. It is held in a cleared area, neatly swept. Oak and pine logs are dragged in for a fire and oriented in an east-west direction. The Tarahumara name for the dance means “moving about the fire,” and except for Peyote itself, the fire is the most important element. Incense from burning copal is then offered to the cross. After facing east, kneeling, and crossing themselves, the leader's assistants are give deer-hoof rattle or bells to shake during the dance. The Kiowa and Comanche were apparently the most active proponents of the new religion. Today it is the Kiowa—Comanche type of Peyote ceremony that, with slight modifications, prevails north of the Mexican border. This ceremony, to judge from the rapid spread of the new Peyote religion, must have appealed strongly to the Plains tribes and later to other groups.